Brixton Fencing Club was established in 2003 to provide epee coaching for young fencers in South West London. From a core of about a dozen young fencers it has grown ever since - and now provides fencing for about 150 adult and junior fencers. Brixton Fencing Club is now the premier epee club in the UK - and our club fencers who joined as novices way back in 2003 now compete on the international circuit and have even represented their countries in the World Championships. Our coaches too regularly support fencers at European senior, junior and cadet circuits. Currently one of our coaches, Oana Puiu is one of two epee coaches for the GB Senior epee team. Although we are a competitive club, we welcome everyone - whatever their reasons for fencing. We have social fencers who enjoy meeting up at on our club nights, but never compete on the British Circuit. Others restrict their fencing to novice competitions. If you learn at Brixton Fencing Club you will get excellent training from some of the best coaches in the UK. Every fencer (who does not represent another club) gets a 5-10 minute lesson at each club night included in the cost of the session. If you compete for Brixton Fencing Club at one of our nominated UK or international competitions you will get coaching support free of charge. This means that the coaches can help you maximise the benefit from each competition you attend. If you fence at Brixton you will find fencers of your ability - and will always be able to find someone more experienced than you, from whom you can learn. We encourage guests from other clubs to join us because we recognise that it is in every fencers interests that they experience as many different fencing styles as possible. But perhaps the best measure of our success is that it is our club-grown fencers who are winning international success. This year we won GOLD in both the Senior Commonwealth Championships individual and teams competitions. Our younger fencers will represent England in Poland in 2019.as part of the Tomorrow's Achievers squad. ​Brixton Fencing genuinely has something for everyone. Come and join us! We will not be breaking for half terms holidays. Brixton Fencing Club has a supply of fencing equipment provided free of charge at each session. Fencers are expected to arrive in suitable footwear; trainers are fine but not outdoor shoes. ​Thick track suit bottoms are advisable for starters but for those who continue to fence, it is best to invest in proper breeches and fencing socks. The Club will run to a strict timetable. This will ensure that there is adequate time for S&C, footwork and sparring. Will take place in 10/15 min slots (depending on the number of fencers present). 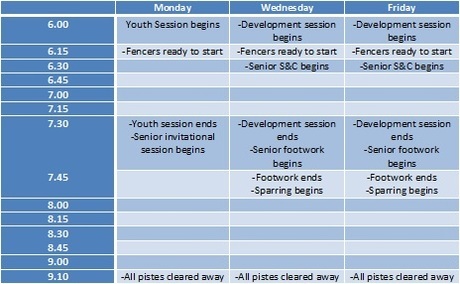 Fencers are to place their names on the whiteboard at the beginning of the session if they wish to have a lesson. Brixton fencers who compete at competitions will be given priority. Fencers are responsible for turning up to their lesson slot on time, if they are late then that time is take from the lesson slot.